This morning sitting on a chair at my desk with a cup of coffee and a typewriter, I feel reality knocking on the door and it’s rude. I’ve been watching some documentaries, or kind of listening to them while doing some mundane work (e.g., painting a lot of the same miniatures over and over), and the idea that humans could potentially live forever, biologically, is so fascinating. 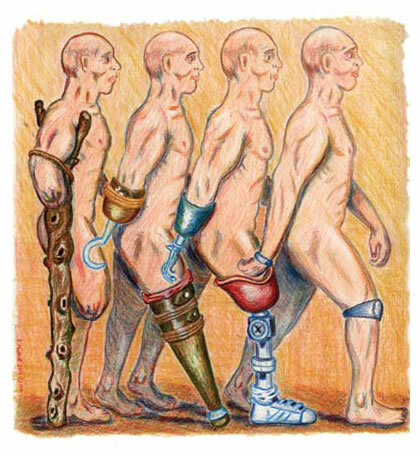 If our bodies are machines, then the parts that comprise our bodies should be replaceable or repairable. Perhaps one day there will be a replacement for a broken spinal cord or a dysfunctional vital organ, like a bad liver or lung. I think this is definitely possible. Take all the parts of a human being, lay them out on the floor (a clean one at that! ), and then by some incredible procedure put them together in the right place, just as we would with do-it-yourself furniture. We make a human body from its individual parts. Let’s say this is possible. Now, at least for me, there is the problem. I cannot envision the “spark” that would trigger the body to awake and live. In the story Frankenstein, the creature awoke from lightning, but seriously, what would this particular life force start? In the brain? Well, really the brain is more than just a single part; which of the brain parts would you start first? The breathing or the heart? I think the spark, or part of the ‘awake’ issue, comes back to the magical things that happen during development in the mother’s womb. There’s a developmental process here, or a slow incubation, like fermented alcohol in the making of a fine wine that needs to happen for a biological organism as complicated as ours to become alive in every sense of the word “alive”. I suppose I’m thinking back to the origins of human existence, my existence, in biological speak. I’m a vehicle that carries me, which is…. the soul? I’m a machine, but I am more because I write. Through words on a piece of paper, I can speak to the future people who have yet to be born. Moreover, I can listen to the thoughts of the dead by reading their words. Machines cannot put meanings in symbols, words, and record them in a way that conveys personalities and characteristics. Some may argue this; that this is yet to come in the future for machine artificial intelligence. But, there’s a deeper sense that we are special creatures. Anyway, I’m just thinking on this peaceful afternoon. Let’s take this into sort of a religious or existential direction. Let’s assume someday every disease can be cured and there is no more “death by natural causes”. Short of catastrophic damage to the body, people will not die. Then, if there is a Heaven, it is possible some people will never experience it. If there isn’t an Afterlife, then all the people who have already died are truly gone forever. Both are tragic. Mortality is a blessing and a curse.